Many years ago when I was first 're-discovering' 1/72nd scale AFV modeling, I was surprised to find that the majority of decent model kits then available were in resin form. This medium was new to me, since I had not built a small scale tank model since the early 1980s. One of the first resin kits I had found and purchased was the StuIG 33 from Rhino Models, which was one of the few American companies making resin kits at that time. I didn't pick this kit due to any specific interest I had in it, but rather because it was the only kit available from that particular model shop. You all know how the "first" of anything can become rather sentimental to someone? In a way, this kit is rather nostalgic for me, since it was my initiation into the world of resin tank models. Unlike the "paper panzers" that others find so intriguing, the very small number of StuIG 33s that were manufactured actually saw combat, which makes it a much more interesting vehicle to me. Over the past several years, many new kits and conversions have become available for this vehicle, which has rekindled my enthusiasm for it. I began investigating both the available kits as well as the vehicle itself, which those of you who are familiar with it will know is no easy task. The end result is this article. I began the production of this article in the same manner as my other comparison articles, by acquiring most of the available kits, as well as accumulating any and all reference material that I could find on this particularly rare armored assault gun. As far as I know, there are no books or other printed publications dedicated entirely to this vehicle, but there are several books which include it in their coverage of German assault guns (see the References section for a list of materials I found helpful). When I was bouncing some preliminary findings of my research off of my good friend Stephen Brezinski, he hit me with a very lucid question: "There are not a whole lot of photos of this I know of, so I wonder if we can judge model accuracy?" This was indeed a good question. Any time we do research on something over 60 years old, we necessarily have to make many assumptions. For example, how reliable is the reference material on which we so heavily depend? Stephen pointed out, "I would not be surprised if there were small variations, particularly between the first batch, and the second batch." My first response to such questions is that we have to make a leap of faith based on the strength of our source material, but that can take us only so far. At all times we have to recognize that what we are doing is still quite speculative, albeit within a framework of some facts. Especially considering that all of my research is secondary, since I have no access to original documents or equipment. For this article, I will first provide some background for the vehicle, as best as I can gather from my references. 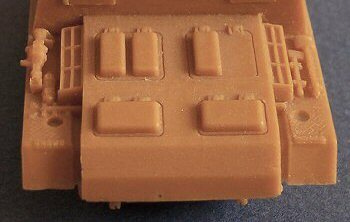 After that I will describe some assumptions I am going to make for the foundation of the kit reviews, beacause many of the differences between the reviewed kits require analysis of the real vehicle in order to make a determination of kit accuracy. Since I have been able to find so few reliable sources of information, I will share the results of my research with you all, so that if someone sees something that I missed, hopefully you will let me know about it. We start with the name. I believe that according to war-time records, the official vehicle name was "s.I.G.33 auf Fgst.Pz.Kpfw.III (Sfl. )", although in most references I have seen it referred to as "Sturminfanteriegeschütz 33" and "Sturminfanteriegeschütz 33B". I don't know where the B comes from. I have seen it abbreviated as StuIG 33 (or Stu.I.G.33) and Stug 33. For the purposes of this article, I will refer to it as StuIG 33 or simply, StuIG. A very short description of the vehicle could be this: the 15.0cm Heavy Infantry Gun (sIG 33) mounted in a fully-enclosed, armored box on the chassis of the Sturmgeschütz III (Stug III). The need for this vehicle was expressed by the Fuhrer in late 1942 as the battles in Stalingrad got bogged down, and the production of the vehicle was really quite rapid, thanks to preliminary development on a similar vehicle already begun in 1941. The initial order was made on 20 September, 1942 with the first group of 12 vehicles being completed less than a month later, by 12 October. This group of 12 is commonly referred to as the "first batch", and was sent to the Stalingrad front immediately, reaching the front lines by 8 November. A "second batch" of 12 vehicles was completed by the end of October, only two weeks after the first batch. These arrived at the front in late November, but in the short time between deliveries of the two batches, Stalingrad (as well as the German 6th Army) was surrounded by Soviet forces, so the second batch never entered the city. No others were produced, so the total production run for the StuIG 33 was only 24 vehicles. The first batch was divided into two units of 6 each, and assigned to the 177 and 244 Stug Battalions within or near the city. All 12 of these vehicles were destroyed or captured during the battle. The second batch was made part of the StuIG Battery of the Lehr Training Battalion, and was tasked with helping the unsuccessful relief effort that was undertaken in the winter of 1942-43 by the XVII Army Corps. Five of the twelve vehicles of this batch were lost during this fighting, and in March 1943 the remaining seven were transferred to Panzerjäger Battalion 140 of the 22nd Panzer Division. This Division was disbanded the following month, and in April the vehicles were then transferred to the 9th StuIG Company of the 201st Panzer Regiment, in the 23rd Panzer Division. This division participated in battles in southern Ukraine throughout the spring and summer months of 1943, and was part of Army Group South's Reserve Army during Operation Citadel (battle of Kursk). This Division was not used in this battle, and instead was sent south to take part in the fighting around the city of Kharkov, so contrary to some accounts, no StuIG 33s saw action at Kursk. The last five StuIGs were reported as lost by the end of October, 1943, exactly one year after they entered service. 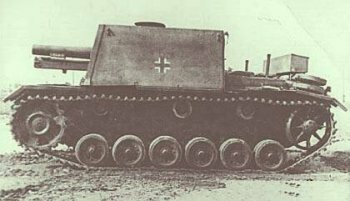 The StuIG 33s were manufactured from rebuilt Stug IIIs, but on which version of Stug? I have seen some sources that state they were Stug III Ausf. E and Ausf. F/8 chassis. I have not seen any description about which batch was which, or how many of each, in any of the printed reference sources I possess. I have seen one internet source claim that the first batch of 12 was built on Ausf. E chassis, and the second batch of 12 on Ausf. F/8 chassis, but there are no references cited at that website, so I do not know where this information was obtained. This now brings us back to my earlier mention of speculation and assumptions. Since there were some obvious differences between the Stug III Ausf. F/8 and the earlier versions, for example the engine deck length and the layout of the engine intake vents, it would be nice to know specifics about the source of the individual vehicles. This is an important question, because some of the available kits of this vehicle have the early (Ausf. F and earlier) engine decks, and some have the late (Ausf. F/8 and later) engine decks. Stug. III early engine deck (Ausf. F and earlier). Stug. 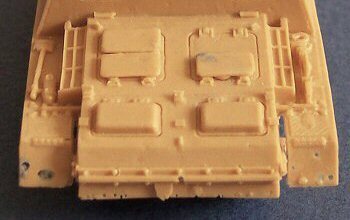 III late engine deck (Ausf. F/8 and later). Two of the more reputable sources (Jentz & Doyle, and Spielberger) make no mention of which versions of Sturmgeschütz were converted. They state only that the StuIGs were converted from "rebuilt" chassis from "heavily damaged" vehicles returned from the front. Unless there is actual documentation somewhere showing the serial numbers of the specific vehicles converted to StuIGs, the only way we can determine which version of Stug was used, is to look at the production schedules of the different versions of Stug III. When you look at the dates of Stug production, it becomes obvious that it is highly unlikely for Ausf. F/8 Stugs to have been used in the conversions, since the F/8 did not enter production until September of '42, less than one month prior to the StuIG 33 production. I find it doubtful that a Stug III Ausf. F/8 could have left the assembly line, been tested and accepted for service, sent to the front lines, been involved in combat, and damaged, and then sent back to the factory for refurbishing, only to be converted to a StuIG 33, all in less than a month's time. In addition to that line of reasoning, I have not seen any photographs of StuIG 33s that show any features of the Ausf. F/8 chassis. Taking both these points into consideration, perhaps it is more valid to guess that the StuIGs were converted from Ausf E and F chassis (or earlier), and not Ausf. F/8. To the best of my knowledge, there is only one StuIG 33 in existence today, at the armor museum in Kubinka, Russia. I believe that this StuIG was one of the first production batch, and was captured at Stalingrad. This is also the vehicle from which the most reputable reference drawings were obtained (Panzer Tracts and Achtung Panzer), and it has the early engine deck layout (Ausf. F and earlier). Assumption No. 1: Because it is unlikely that any Ausf. F/8s were used for the conversions, I think that it is reasonable to assume that only the early (Ausf F and earlier) engine deck style is valid. Until I find evidence that suggests otherwise, I will evaluate the following models with the assumption that all StuIGs from both batches had the early engine deck. Another feature that varied between the several versions of the Sturmgeschütz III was the shape and style of the maintenance inspection hatches on the front hull plate. The earliest Stugs had two double-door hatches with single, very large and bulky hinges on the outer edge of each door. At some point during the production run of the Ausf. E (which ended in February 1942), the hinges were changed from the single, large hinges, to two small hinges on the outer edge of each door. This was the style of hatch that was present on some Stug III Ausf. Es and all Ausf. Fs. I have seen photos of StuIG 33s with both of these hinge styles, so either one would be appropriate for these kits. However, two of the kits show a third style of hatch, with single-door hatches. I believe that these are supposed to represent a late style of inspection hatch used on the Panzer III, and was never seen on Stug IIIs, and hence neither on StuIG 33s, so this style of hatch is incorrect. Early Stug. III inspection hatch style. Late Stug. III inspection hatch style. Late Pz. III inspection hatch style. Assumption No. 2: The inspection hatches on the upper glacis plate can have either the single, heavy-duty hinges, or the double, smaller hinges. The various StuIG 33 kits available to us show great variation in the size, shape and details of the fighting compartment that houses the sIG 33 cannon. Is such variation possible? After all, these vehicles were hand-made in very short order. I believe that this was the point that Stephen was making with his earlier question. I know nothing about manufacturing real tanks, so I can make no authoritative comments on this, but my educated opinion, such that it is, would be to say that NO, there should not be much variation. I suspect that when the order was recieved to make these vehicles, engineering drawings were made with great (though hurried) precision, and because all the vehicles were made at the same facility, all of their armor plates were likely cut using the same blueprints. Assumption No. 3: The Kubinka StuIG 33 is indicative of all 24 StuIGs concerning the size, shape, and details of the fighting compartment. This is an important assumption, because as you will see, several of the kits reviewed in this article have fighting compartments that are very different than the scale drawings. Based on what I hear from other modelers and have seen on the internet, it seems to be a common assumption that the first batch of StuIGs was painted in panzer gray (possibly with some disruptive camouflage added in green or brown, probably while in the field), and the second batch were panzer yellow, again with green and/or brown camouflage. At the time these vehicles were built, the factory standard color was panzer gray, and since all 24 were built during October 1942, I assume that they were all initially painted gray. This is probably how they appeared during the battles in and around Stalingrad during the winter of 42-43, perhaps with whitewash added when there was snow cover. German paint standards changed in early 1943 to the panzer yellow scheme (with camouflage), so I suspect that the seven StuIGs still alive at the time of transfer to the 23rd PD in April, were repainted in this scheme at that time. I welcome any further information about the camouflage schemes of these vehicles.